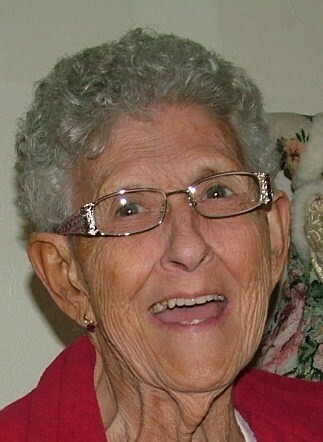 Dottie Jane (Lightner) Doss, age 89, joined our heavenly father on January 27, 2019 at home surrounded by family. Dottie was born October 22, 1929 to James and Blanche Lightner in Chillicothe, MO. In 1947, Dottie married the love of her life Henry (Buss) H. Doss, Sr. and began an incredible life together filled with love, laughter, and many happy memories. In 1955 they welcomed a son Randy, 1956 a daughter Sandra and in 1958 a son Mark. In addition to raising their three children Dottie worked for the Missouri Public School District as a cook at Central School in Chillicothe, MO and Princeton R-V in Princeton, MO. Dottie and her husband owned and operated the DX Station in Princeton, MO before moving back to Chillicothe in 1991. She was a member of the Free Methodist Church and Women’s VFW Auxiliary. In her spare time, Dottie loved to travel, visiting her children in Columbia, MO, Colorado, California, Oklahoma, Nevada, a niece in Nebraska and a niece in Kansas, she enjoyed watching football games on TV, listening to Elvis and country music, reading her bible and doing her bible study, working puzzle books, having coffee and spending time visiting with her sisters and friends. We want to wish her a safe journey. We will remember her smile, her warmth, her energy, her strength, her love for life, family and friends. She worked very hard all her life, Dottie faithfully cared for family, a woman of faith she shaped their spirituality by her tireless Christian example. Family and friends were her passion and delight. She made a difference in the lives of many. Words cannot begin to express all the emotions in our hearts at this time. Dottie will be dearly missed, but we will always cherish the many memories we made together and the undying love she had for her family and friends that we will carry with us until we meet again. Dottie is survived by and took extreme pride in two sons, Randy Doss (Margie) of Del City, OK., Mark Doss (Mary) of Columbia, MO, one daughter, Sandra Feese (Richard) of Henderson, NV, five grandsons, Clint McLain (Brandi) of Columbia, MO, Derek Doss currently in Saudi Arabia, Jarred Doss (Megan) of San Diego, CA, Cameron Shock and Cody Doss both of Columbia, MO and five granddaughters, Courtney Beavers of Branson, MO, Ashley Baysinger (David) of Boonville, MO, Ciarra Doss of Kihei, HI, Chelsea and Crystal Doss both of Columbia, MO., twelve Great Grandchildren, Kaitlyn McLain Strickland, Schelby Beavers, Madison Wiles, Madison Beavers, Michael Beavers, Conner Baysinger, twins Hailee and Hayden Williams, Dre Cerezo, Amari Doss-Hayes, Logan Baysinger and Curry Noble, two Great Great Grandsons, Kasher Strickland and Grayson Bias. Three sisters, Estelle (Heavy) Donelson, Helen (Annie) DeWitt and Judy Wilson (husband Richard) all of Chillicothe, MO and many nieces, nephews and step-grandchildren. Dottie is preceded in death by her husband, Henry (Buss) Howard Doss Sr., her parents, James and Blanche Lightner, two step-sons Henry (Bill) Doss Jr and Charles Doss, one step-daughter Joyce Cruickshank, four brothers, Jack, James, Roy and Billie Lightner, four sisters, Patricia Lightner, Betty (Peg) Milusnic, Norma (Deanie) Mayberry, Delores (Poogie) Melte, Step-Granddaughter Kathy (Sis) Cruickshank, Step-Grandson Charles (Chuck) Courier, Great Grandson Jayden and Great-Great Grandson Matthew. The family wishes to thank all of those who helped care for her during her illness. A special thanks to Dr. Chris Hulett, Dr. Jeffrey Burns, Dr. Raghavendra Adiga, Dr. Nancy Chu, RN Samantha Villanueva, Judy and Richard Wilson, Helen DeWitt, Teresa and Rob McWhorter. The family is deeply grateful for the outpouring of love, prayers, and support in many heart-felt forms from too many people to name individually, but including: medical staff, family and friends – either through prayer and/or visits.